With ready-to-grow kits, you can have fun with fungi indoors, all year-round. GET YOUR GARDENING fix without going out in rainy, cold, winter weather by growing mushrooms right in your own kitchen. Occasionally, local nurseries or grocery stores carry kits for different kinds of mushrooms, or you can order them online. 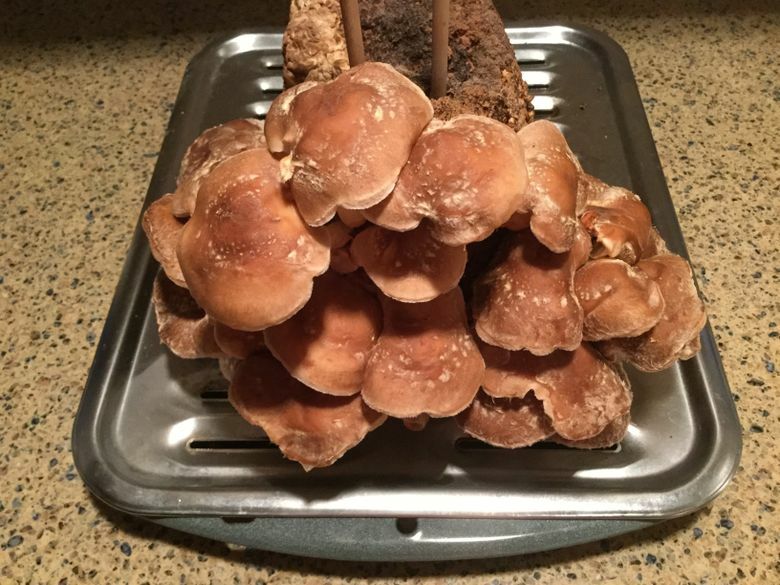 I ordered my organic shiitake mushroom-growing kit from Cascadia Mushrooms. The only problem with growing mushrooms indoors is that it can be tricky to convince your significant other that the growing block, somewhat resembling the Creature from the Black Lagoon, will be a nice addition to the kitchen décor. If you can talk him or her into trying it, however, it actually looks quite nice when covered with a delectable crop of mushrooms. The kits come in a plastic bag. 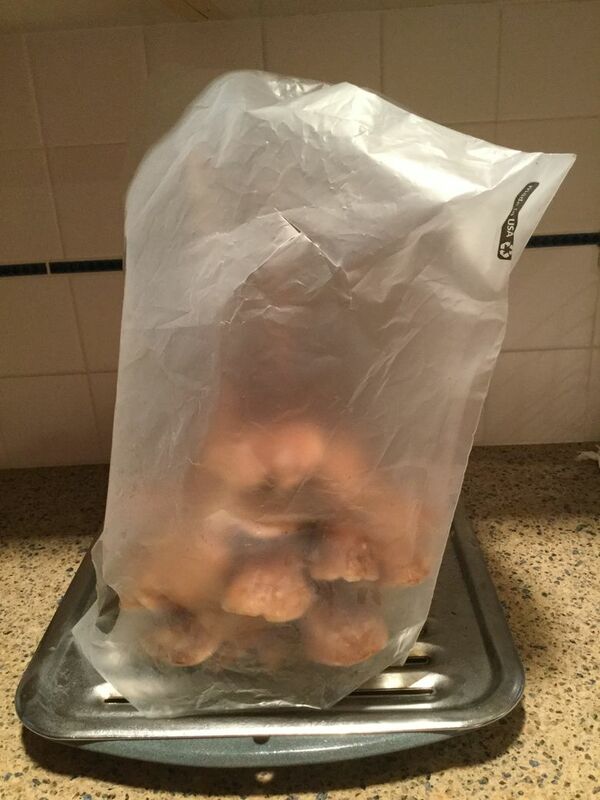 If you aren’t ready to start growing the mushrooms within a week of receiving the kit, you can refrigerate it in the bag for up to four weeks. Once you’re ready to start the process, the first step is to activate the block. You do this by removing it from the bag and placing it in a clean container filled with cold, nonchlorinated water for about 12 hours. The block must be completely submerged, so if it floats, put a weight on it to keep it underwater. Make sure the water is nonchlorinated. Chlorine is a fungicide and will kill the spores that produce the mushrooms. Use distilled water, or you can remove chlorine from tap water by allowing it to sit in an open container for at least 12 hours. After you remove the block from the water, place it on a large plate or a baking sheet, and locate it in a normally heated, well-lit room out of direct sunlight. You need to mist the block regularly, so it’s a good idea to put a baking rack under the block to keep it from becoming soggy in the water that collects. The next step is to make a humidity tent. Do this by sticking four 12-inch-long chopsticks or knitting needles a few inches deep into the top of the block. Their purpose is to support a clear or white plastic bag that will fit loosely over the block to help maintain adequate humidity. Cut a few X-shaped slices into the bag to allow the tent to breathe. Once the tent is set up, you’ll need to remove it in order to water the block. Squirt it with nonchlorinated water from a misting bottle at least twice a day. Before long, you’ll see a crop of tiny mushrooms showing up all over the block. Keep misting regularly, and over the next 10 days, they’ll mature into full-sized mushrooms. Harvest as soon as the caps and stems are decent-sized, either by snapping them off with your fingers, or cutting them off with sharp knife. They’re best eaten right away, but they will store for up to two weeks in a paper bag in the fridge, or they can be dried for longer storage. Once all of the mushrooms have been harvested, use a knife or scissors to carefully cut off any remnants from the block. Then reactivate the block for the next crop by submerging it in cold, nonchlorinated water again, this time for 24 hours, before repeating the steps above. Normally, the kits produce four harvests, but occasionally you can get six out of them, although the last couple usually aren’t quite as productive. A typical harvest produces about a pound of typically sized mushrooms. Sometimes, however, the entire harvest consists of only a few extra-big ones. The first time I grew my own, for some reason the block produced only one enormous mushroom that weighed more than a pound. That honker was so big and scary, my wife wouldn’t try it until I survived a day after taking a bite. Now I have to race her at harvest time. Ciscoe Morris: ciscoe@ciscoe.com. “Gardening With Ciscoe” airs weekly on KING 5; check listings.